Ever since digital cameras took decent video I stopped carrying around my DV video camera and instead use my point and shoot digital camera to take a few minutes of MOV or MPG video here and there. The only problem is my digicam is not equipped with a light to brighten up the videos I take indoors. So a while ago I searched for an LED light to use with my digital camera and I found one company camerabright.com that makes one that you screw into the tripod mount standard on all cameras. It costs about $30 to $40 bucks, has 4 white LEDs and takes 6 CR2032 coin cell batteries. I thought the price was ok, but there were some things I didn’t like about it and other people have also commented on. So I decided to make my own and show you how. First here is a comparison of the ProdMod DIY camera light vs. Camerabright. SIX Coin cell batteries – not fun to buy in a pinch, expensive, not rechargeable. The light is narrowly focused and produces a sharp spotlight effect surrounded by darkness. Continuous run time is only 4 hours. Wide angle bright illumination, no spotlight effect. Continuous run time 16 hrs – **by calculation with 1000mAh battery **See actual test results here with 900mAh battery! Weight: 2.3 oz with the batteries. 0.8 oz without. Bonus: If you want you can choose different color LEDs, or mix them together for your own unique effect. Bonus 2: Remove the mounting screw and you have a slim but powerful flashlight. With this version of the DIY you will not be able to mount it to a tripod and camera at the same time. But if you are using it for macro shots you’d be better off with a ring light anyway. The Prodmod Ringlight is currently in development and should be ready sometime in Feb 2008. If you have particular requests you can contact me or vote on this poll. One 4xAAA battery holder with switch: $1.29 now $1.39 2008 price increase! One ¼ watt 7 ohm 10 ohm = 5 cents *you can also try 15 ohms if you wish to limit the LED current to 20mA in worst case. —->A cap screw is probably a better approximation to a thumb screw that we are trying to mock up. You can find these in packages of 2 for 88 cents. So it’s more expensive but creates a more comfortable thumb screw. You can buy all of these materials separately but you’ll be paying shipping costs for each vendor. Shipping costs alone add up to be more than $20!! So I have put together a kit of all the parts for you to buy and save you the money and hassle by only charging $9.99+$5 Shipping. ** Try a 3/16 bit first (more common) its about .010″ under 5mm. The 13/64 can be too big for the LED and require gluing. A #9 bit seems to work as well. This battery holder is great because it has a cover and comes with a switch. This is going to house your batteries and LEDs. This holder has chambers for 4 AAA batteries but you only need 3 to run these lights. The other chamber is going to give you room for your LEDs and your mounting screw. So go ahead and remove the last spring contact opposite to the switch. You can use a small screwdriver to do this. Insert it through the spring and lift straight up. If you are going to mount this to your camera you’ll want to drill a hole in the top so a screw can pass through it. If you just want to make a cool flashlight skip to step three. In my first prototype I had the screw head hidden inside the housing to give it a clean look and flat bottom surface. I have a tutorial to show you how to do it yourself. When it’s done it will look like this. But for now I recommend to just pass the bolt through the entire body of the light. So you will be making a hole through the battery door as well. So it’s going to look like this. I chose to make a hole in the main body first and away from the switch and wires. The hole shown here is in a good position because we don’t have to try too hard to squeeze the 3 LEDs in place. In fact you can probably make yours a bit closer to the end. I made this hole first, then I closed the battery cover and used this first hole to guide the location of the second hole you make in the battery door. The screw threads should only be sticking out about 1/8”. Go ahead and try mounting it to your camera to see how it looks. My lumix camera’s tripod mount is all the way over on one end. So I chose to push the screw through the door side first. This caused the switch to be on the top surface which is actually handy. Here is the light in the same orientation mounted on a Nikon. The mount hole is near the middle. In this orientation the light is a bit too close to my right hand and difficult to hold. So here is the nikon with the light flipped. You can see the switch is now on the bottom. Now you are going to do some re-wiring to convert the 4xAAA holder into a 3xAAA holder with space for the LEDs. You have already removed the negative spring contact, but now you have to move the positive contact and red wire to the other end for your third battery. Take a thin flat head screw driver and pry under the positive contact until it loosens. You may have to also insert the screw driver vertically between the contact and the plastic housing wall to loosen it up the locking tab. Then pull the contact and wire out of the case. Now you will insert this contact and red wire to the other end of the case to complete the circuit. Now you’ll need to run the red wire to the corners like shown to make room for the battery. A small screw driver or thin blunt object helps. Be careful not to cut the wire or break the insulation. While the wires are off to one side prepare to drill holes for the LEDs. Since the LEDs are 5mm you want to measure 2.5mm from the lip of the case as an easy way to keep things centered. Mark that with a knife or pen. See photo for details. Then use a marker to decide where the three LEDs should go. I started with one closest to the wires and then spaced my other two about 10-12mm apart. Drilling Tip! Use a smaller drill bit at first to create a pilot hole because it’s easier to keep steady and more precise. This smaller hole will also help keep the larger drill bit from “walking” which means your hole might not end up where you thought it would. Try to keep your drill perpendicular to the surface so the LEDs will stick straight out from the body and not at different angles. (For wider illumination coverage you can purposely angle the left and right LEDs toward the outer edges but it makes assembly a bit trickier.) You also don’t want your LED too close to your mounting screw. YES you can fit 4 LEDs in the same battery holder if you keep the holes closer. But you must recalculate the resistor in the next step. Your LEDs will be soldered together in a parallel circuit. So it might be a good idea to do a dry run to make sure the LEDs are working and they fit properly. See the diagram for reference. LED TIP! Remember the longer leg of the LED is positive (anode). Connect the longer leg to your resistor and the resistor to the red wire. WARNING! This is an unregulated circuit. The voltage of batteries that are newly recharged are higher than 1.2V per battery. The total battery pack value can be as much as 4V for 3 NimH AAA cells. To limit current to the LEDs a more realistic calculation can be used where the power supply is set to 4.1V instead of 3.6V. Or you should perform tests as shown below. About this parallel circuit: It was chosen because it uses the least number of components and is simple to construct. Our calculation assumes each LED has the same forward voltage but in reality they can differ by as much as 0.4V. A better parallel circuit would be one where each LED has its own resistor based on that LED’s forward voltage. But for the purposes of this inexpensive and easy project a single resistor design is adequate. For testing I found it easier to just insert the LEDs backwards for now as shown. Don’t forget to use your resistor between the positive power wire and the positive terminals (longer leg) of the LEDs. You must make sure ALL LED legs are connected to the proper positive and negative wires otherwise you will send too much current to the lit LEDs and reduce their life or blow them out. I used alligator clips to keep the LEDs attached and touch the resistor to the red wire while its connected to the positive LED legs. CORRECTION! The batteries were not fully charged when this test was performed and the circuit in this photo used a 7 ohm resistor. Since this system is not regulated the battery supply voltage would be much higher if the batteries were freshly charged. The batteries were recharged fully and the test was repeated. The closed circuit voltage of the battery pack was 4.18V. The total current draw at that voltage with 7 ohm resistor was 96mA or 32mA per LED. Although the battery voltage will reduce over the next hour or so this initial current drain on the LED is higher than I prefer so I switched to a 10 ohm resistor and repeated the test. Now the total current draw is 77mA or 25mA per LED. This is satisfactory to me, but you may choose to be more conservative and prevent the LED from ever drawing more than 20mA. For that you would use a 15 ohm resistor. You must acknowledge however that allowing the LED to draw more than 20mA will damage the LED and reduce its life. Here is my new circuit with 10 ohm resistor. Use the holes in the casing as a makeshift fixture to hold the LEDs in place while you solder the LED legs together as shown in the photo. This helps keep the right distance between each LED while they are soldered together. Keep the LEDs in the same orientation so each positive leg is connected to the other positive legs, and each negative leg is connected to the other negative legs. You should bend the LED legs close to the LED body because you don’t have much space in the battery holder. Insert the LEDs loosely into the battery holder and bend the LED legs into the chamber with the wires. You may have to trim the legs a bit. Be sure to keep track of which side is positive before trimming legs!! I also cut some of the plastic to give more room for the legs but you might not have to. Now all that is left is to connect the wires and resistor and slide the LEDs into place. I have the positive legs on the bottom so the red wire was trimmed to about 1” past the battery and soldered to the resistor which is then soldered to the positive legs of the LEDs. You should do this soldering while the LEDs are OUTSIDE of the holder. Otherwise you risk melting the plastic. After you solder the red and black wires you should have enough room to slide the LEDs back into the holder and push them through the holes. I used a small screw driver to push on the clear plastic casing. DO NOT push on the legs they will bend and you might create a short. Also make sure that your black and red wires are not touching and that the top and bottom legs never touch! If you did want to hide the screw head in the housing you would push the hex head down into the holder and hot glue it in place. Make sure it doesn’t make contact with the LED or the LED legs. The socket of the camera is only 1/4” deep but this screw will probably project about ½”. So after you slide on the battery cover you’ll have to screw a nut on the other end and use that to tighten the light in place on you camera.. You can try using a shorter screw to avoid the nut, but it would be very hard to tighten it and have the light aim in front of the camera at the same time you’ll have to align the screw poperly which is discussed in this article. The the photos below show how you can use the 3/4 inch bolt and a nut. But if you are taking a simpler approach like I opted to, you would pass the bolt through both holes and simply tighten in place. This is the method I prefer since when I take videos I would be holding the camera in my hand anyway. When you are not using the light you can just store the screw inside the housing and close the lid. If you don’t want to have to store the screw, but would rather it remain attached to the light housing click here for options. Now go ahead and turn on the light. If you used the recommended 60 deg angle LED the light should fill up most of your viewing screen as seen in the first photo. If however you used some standard white LEDs that are probably 20 deg viewing angle you would probably see a harsh spotlight affect as in the second photo. This is similar to what you would get using the Camerabright product. Filling more of your screen with light is better for still photos as well because it allows the camera to focus faster and take a better picture then if it had to compensate for the black circle spotlight effect. If no light is turning on you should turn it off and check for shorts. Make sure the batteries are charged and you have wired the LEDs with the right polarity. Total cost of project = $2.00 not including batteries or any shipping charges. Total run time (with 1000mAh batteries) is calculated to be 16 hours, which is 4x as long as the Camerabright product! (1000mAh / 60mAh) = 16.6 hrs. *** this is not actual test time. Even if we have 4 LEDs at 20mA each it would last about 12.5 hours. Click here for actual test time. Actual time may vary and the lights will dim as the voltage drops. But the NiMh batteries have good chemistry which keeps the voltage high for most of its life. Dimensions of the case are 2.44″x 1.89 “x 0.55″ (not including screw) which is actually smaller and thinner than the commercial product which is 2.7 x 2.5 x 1″. So if you have completed this project you have just saved yourself at least $28 and have a smaller sleeker product. 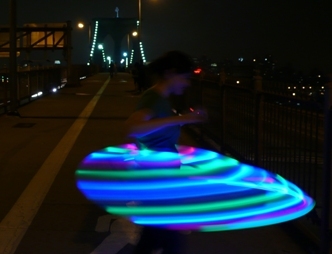 You also have the ability to try other LEDs and experiment with colors. Built-in screw stud – a much cleaner compact look! 4LED- you have room for one more. New Photo Test! – how bright is it? What added features would you like to see explored for the ProdMod LED Camera Light? There are updates to projects everyweek! Why not subscribe and have the articles delivered to your reader? THose radio shack boxes are great for projects like this I use them all the time. You have some great fabrication ideas here though. Very nice write up, I wasn’t expecting such a big write up for something on the “simple side”. Good to see true documentation once in a while! Keep up the great work! How did you come up with 7 ohm ? What’s your recommendation for LED types and resistor if I want to put 4 LEDs and brighter ones ? Thanks for the comment, and I am glad you pointed out the difference between the calculated resistance and the 7 ohms I chose. I should have explained my decision in the article. I basically tested the current draw of the system in step 5 above. The 7 ohm worked well in place of a 5ohm resistor becuase the actual total battery voltage was higher than 3.6V. And the forward voltage of each LED was not necessarily 3.3V. But I now also realized that I overlooked something else. The batteries may have been higher than 3.6V but they were not freshly charged. In fact if you use freshly charged batteries in this system with 7 ohms you would be driving excessive current through the LEDs. Some batteries can total 4.25V when freshly charged. And can maintain that voltage for a few hours. When you over drive an LED you risk burning it out and reducing its life. For my purposes I was comfortable with this risk because I wanted to maximize the brightness over the life of the battery. I wanted to keep the current around 20mA towards the end of the battery life where the votage is more like 3.2V. But now that I reviewed this again, I am going to be sure to add another resistor value to the DIY kit. This way you can choose to base your resistor value on the worst case scenario where your battery voltage is over 4V. Thanks for your assistance in pointing this out. This is the disadvantage of an unregulated circuit. If you don’t want to deal with this uncertainty then you will need to regulate the voltage. You can use a very cheap voltage regulator (25 cents to 1 dollar) but they are not very efficient, so although you’ll run the LEDs at a constant current, the batteries might not last as long. For this project I was aiming for simplicity and cheapness. You’d also have to find room for the regulator anyway. There are some other more efficient ways to regulate voltage that I will be exploring in the next version of this DIY kit in the next few weeks. As for your 4 LED question I recommend using 4V in your calculation for power supply and 3.3 for forward voltage. 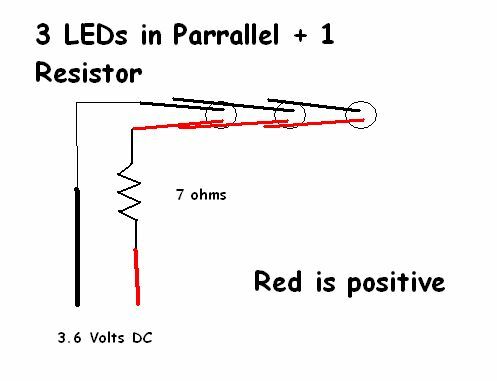 Then use the closest resistor and test the current draw using a multimeter. 20mA x 4 is 80mA. So your total current draw should not be much higher when the batteries are fully charged. Over time the voltage will drop and so will the current and brightness of the LEDs. And as for what resistor you use if you use brighter LEDs? Well fortunately for calculations the LED recommended current is almost always 20mA (with some exceptions). So even if you went out and bought a brighter LED you would try not to provide it with more than 20mA. You should be able to get a hold of the LED specs which would tell you what current it is rated for. Also keep in mind that some LEDs are specified to be brighter but may also have a more narrow viewing angle. Suggestion for the tripod-mount issue… I’ve been collecting old cameras for a while now, and sometimes they come with a case. In these old and musty snap-on cases, they usually had a tripod mounting screw on the bottom, guaranteed 1/4-20″ thread Maybe it’d work for this project, probably hard to find though. See the link, maybe it’ll help. Nice job tho, I’m definitely making a few of these. This opens the possibility of IR LEDs for night-view shooting, depending on the sensitivity of the camera. Yep. 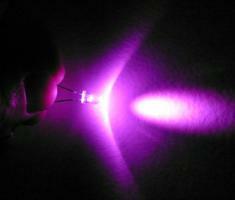 I tried low wavelength (880nm) IR LEDs with both the lumix and nikon coolpix cameras, but they weren’t bright enough. Based on my research so far it usually has a lot to do with IR filters that are built into the cameras. They actually block IR light to make a better picture. IR LEDs work a lot better with most Webcams and cheap toy cameras. Basically cheap cameras don’t have good IR filters. You can also modify new webcams by removing the IR filter which you wouldn’t want to attempt with your point and shoot. I think we still have some of the IR LEDs lying around. If you want to buy the DIY kit I can substitute IR LEDs with your order just let me know in advance. You should give it a try and post your results here. Wow. Cool idea, but Powerizer (nee BatterySpace) racked up my shipping charge at $7.47 for your (now) $1.39 battery holder. Likewise, Buy-LEDs-Online lets you purchase a single LED at $0.12, but charges you a minimum of $10 shipping and All Electronics makes you buy a minimum of 10 resistors at $0.50 and charges $7 to ship it. So cost to produce a single LED camera light is a minimum of $26.48 (give or take for shipping), unless people plan on parceling out the shipping by making many more at a time like you. Links to, say RadioShack or some other B&M electronics shop, which would be more expensive for the items, but at least a common enough store you could walk into without paying and waiting for shipping — would the following be suitable? Tony C, thanks for the links. Sorry your comment was stuck in the moderator. You are absolutely right about the shipping charges and that is why I refer to it in my article and I am selling the DIY kit with all the items you’ll need for only $9.99+$5 shipping. You could go out and buy the parts individually, but I never seem to find all the parts I need in one Radio Shack. The battery holders in the stores never seem to have the switch on them. So whether you are driving around or taking the train it’s going to cost you time and money to track it all down.What is online is rarely in stores. You could have spent that time building it already or thinking up something cool. Just yesterday I had to go to three Radioshacks to find three different items. That right there defeats the purpose of your project because you will be creating an annoying spotlight effect like you would if you bought the Camerbright product I mention that costs $30. You’ll want to use the wide angle LEDs to get better coverage. If you buy the kit from me, you just wait 3-5 days and you can start working. No need to waste time searching the Shack. Well, with some mods and extra $s, 3x 3W LEDs ($5 each free shipping, http://www.dealextreme.com/details.dx/sku.4282) and an AA holder (2800 mAh Ni-MH), a really good light for video ( 9W )! Yes, only 40 minutes, but who want 16 hours? I definitely plan to try using other high power LEDs but I am not sure what I will have time for. Do you want to try your idea and make a prototype? You can post your instructions or just your final product on this site. As for those high wattage LEDs, I think they can get pretty warm. Does this one have its own heat sink built in? I see your point about 40 minutes vs. 16 hrs. It all depends on what its for and how frequently you’ll want to change batteries. 16 hr run time doesn’t mean you’ll have it on that long. But it means you can go 2 or 3 days of heavy use without needing a recharge. Carry it in your pocket or camera bag, or leave on the camera and have it ready to go. 40 minutes sounds like the same amount of time halogen lights last. So you lose your advantage there. It might work for you as a video light as long as you keep extra batteries around, like if you are video taping a wedding or a party. I guess it’s a trade off, people like LEDs because they take little power, last long, are tough, are cool to the touch and weigh very little. But if you want high brightness like a halogen you start getting hotter and more power hungry. So I guess it all depends on the application. Either way. It’s is great to hear your ideas for improvements! Keep it coming! You are playing with Mods… Very good for learning-training. I always try so “solve” a problem. I use cameras for a very long time. To have a better picture or video, you need light, a lot of! If you use ~ 200mW light (3x 3.7Vx20mA), will improve the quality over a complete black picture, but for a picture in the night no, just your eyes will see a difference. For the camera it means nothing. You need much more power. 30 years ago I used hallogen lamps (24V 250W – from projectors), with D size rechargables. You could use zoom to have a nice shot in the might at about 100m, or underwater at about 10-15 m. Do you realize this is 3 times powerfull than a car lights? For a “normal” use, up to 5-7 m, you need a more than 3-5 w light to help. Most commercial stuff have 10-50w. A camera flash, use about 100 joules of energy, and for the very short times of exposure, develop a 10,000w or more. As a “strange shape” light, your mod is very nice, and can help you to have a better sharp of camera (if manual), but does not improuve much the quality of the picture. If your camera work at 3200 or 6400 ISO (high sensibility), you will inprouve the picture, but be aware, a lot of noise will be present. If you want to get rid of noise, you’ll need some juice LEDs to do it. a) how blinding is the LEDs? can you post a video of the camera and some more sample photos? Great questions. I have been meaning to get to this anyway. So I have posted a new article to address the questions of brightness and range. In summary, the ProdMod LED’s are less blinding than that of the Camerabright model because they are wide angle beams. The total reach of the light or range can be described as 5ft x 5ft at a 6ft distance. This is the size of the circle of light you would see on a wall if the light was six feet away. To get this large of a circle Camerabright users would have to stand 10 ft away, so it gives you an idea of how wide the angle is on the ProdMod model. hey zxcasd, The LEDs I used are 560MW7C and the spec sheet can be found here http://www.cockayne.org/Buy_LEDs_OnLine_PDF_Files/560MW7C.pdf. And if they require 12V its probably because it’s designed for your car or your PC. And it probably comes with a resistor somewhere. Send me the link so I can check it out. If the LED only needs 75mA or 20mA, it would be a waste of energy to run it at 12Vdc if you dont have to. The resistor is just going to dissipate and waste more energy in the form of heat. If I am wrong please correct me. after a quick search I found these LEDs on ebay, item number 170185790313,but if you look at the description the viewing angle is only 30degrees. So this will give you the spotlight effect I try to avoid with my design. and its also 10mm large so it might be hard to fit into teh small case. the poll won’t let me add an answer. lanyard I lost mine is what I wanted to add. I just wanted to leave a simple thoughts to talk about that your weblog was awesome. I discovered it on google seek right after dealing with many other information which had been not really related. I believed I’d discover this much sooner thinking about how excellent the content is. could connect with it better. Youve got an awful lot of text for only having 1 or 2 pictures. You are a genius.I love the article.Later,I want to try it like this.Thank you.